Is NYSE investor credit a signal? There is always a point when too much credit leads to a market correction. 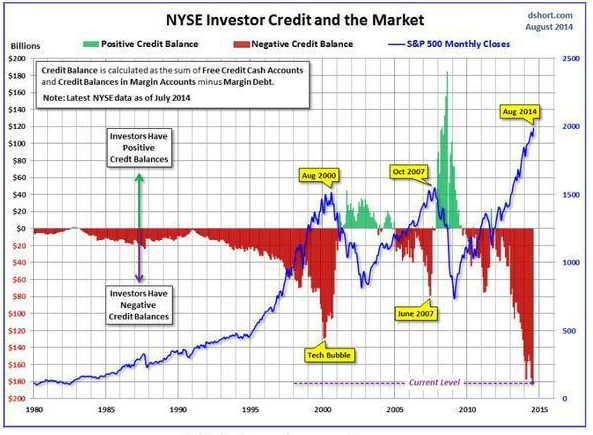 There is a tipping point and we may be at another one when you look at NYSE investor credit. Unfortunately a close look at the graph shows that the tipping point will change. We are at credit extremes but if you used past tipping points you would have been a net loser. The market moves higher and negative credit balances continue to grow. What is going on here? Walked through all of the Jackson Hole papers and came to the conclusion is that theme of labor markets was very appropriate at this time and that all said the conflicting evidence between cyclical and structural issues are real. Yet, the take away from all of these papers is that labor markets are going through structural change and credit policies may not solve all the problems seen on the Yellen dashboard. Simply put, labor problems cannot be solved through monetary policy alone and going it alone may have major negative ramifications. However, if you believe in the precautionary principle for making decisions, it may not make sense to raise rates and be the Fed Chairman who stopped the poor recovery. (One could argue that the precautionary principle could be a good reason to raise rates but that is for another discussion.) The bias still seems for a delay in a rate increase given there is the continued counter-factual view that if a zero rate with QE was not tried the economy could be worse off. The complexity of labor markets was presented in all of the papers. For example, the Davis Haltiwanger paper on labor fluidity suggests that labor markets are changing because there is less mobility. There is less reallocation and churn in jobs which makes for higher unemployment for the young, old, and marginal worker. This is a structural issue. 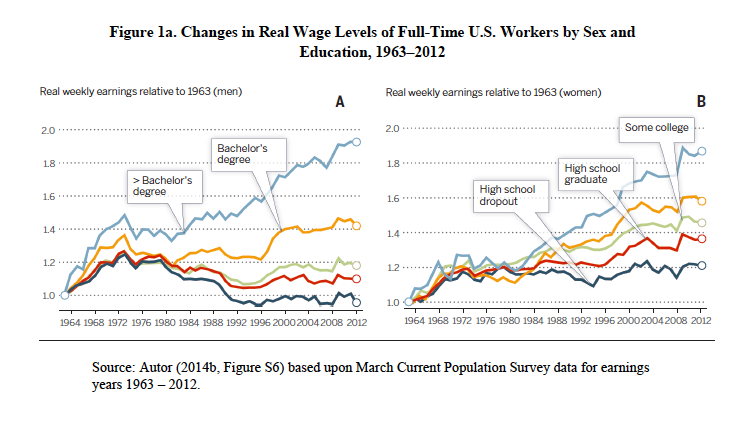 Autor provides an analysis of real wages which suggests that the flattening of wage growth began before the financial crisis which again suggests a structural issue.The exception was for those with advanced degrees. The panel on demographics reported evidence that again the employment problem is structural. However, Song and von Wachter provide an interesting study that suggests that the long-term unemployment in the Financial Crisis may not be dissimilar for other recessions. This may suggest that counter-cyclical policies have and can work to alleviate labor problem. Bertola presents evidence on labor elasticities across countries and show sthat labor rigidities have an important impact on employment levels. The stories are all of the same. The labor markets are complex and the transmission between monetary policy and hiring is not clear. The yield gap model is an important tool for determining valuation in equities. You just have to look at the yield on a long-term Treasury versus the earnings yield of a stock index. There have been problems with this type of model, but it generally works as a good simple pass on the data. If the earnings yield is higher than bond yields buy equities. If bond yields are higher than earnings yield buy debt. If the yield gap gets larger, then hold less equity. This allocation can be mapped into a set of equity and bond weights. 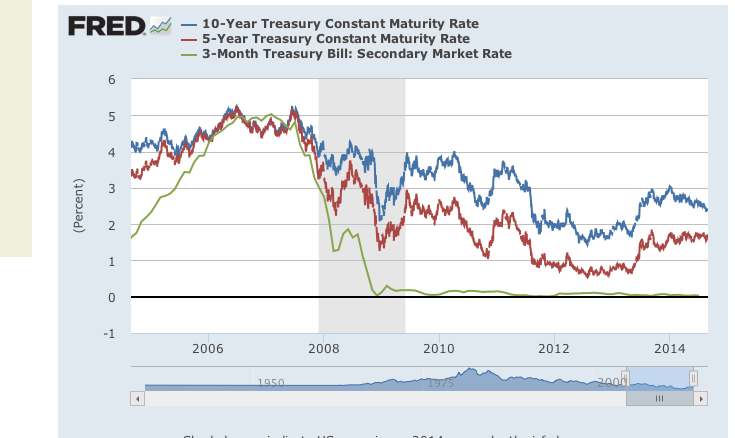 A simple problem with this simple model is that is does not account for the yield curve. You are not accounting for the price of money through time. 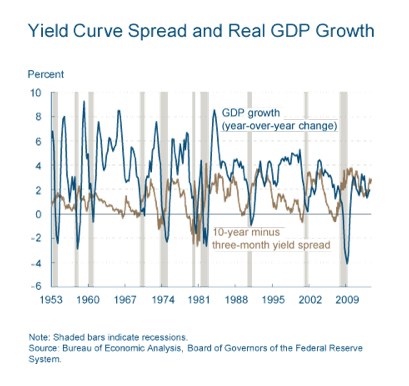 We know that the yield curve tells us a lot about the economy. 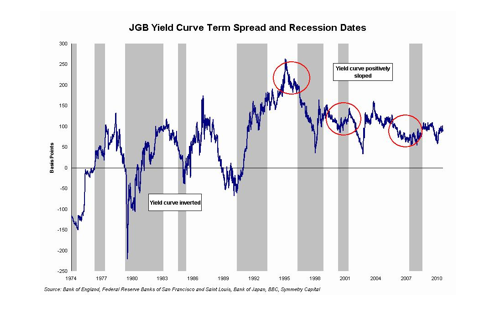 An inverted yield curve will usually precede a recession. The yield gap in a short-term rate can be compared with the yield gap of a long-term rate. If there is a significant difference between the two, it tells us that there is a difference in the shape of the yield curve. This can be used as an added signal for determining the market allocation. This type of model is used at BlackRock. Of course, it could be used separately as a two part or dual model of yield gap and yield curve instead of a combination of two yield gap models which switches based on the difference between the yield gap model. The yield gap or Fed-type models have had a mixed history, but still seems to be an easy way to provide a first pass at relative value that can be employed by most investors. The buzzword from central banks for years has been transparency, yet here we are post-Jackson Hole waiting for Chairman Yellen to again say something important about policy. We don't know what the rules will be for changes in rates. Policy should not work this way. It should not be a balance of pros and cons based on a speech. It should be translated to action through clear rules. The verbal should be employed to explain why the rules are not being followed. It should be the exception not the norm. In the 60's and 70's pre-rational expectations, there was the belief that economists could engineer changes in the economy and that we could employ optimal control to solve monetary problems. The Lucas critique and the rational expectations revolution changed that thinking. It was argued that transparency was needed to reduce uncertainty but policy models for engineering an economy would not work. Still, we are now at an extreme that there is no model for how transparency will work. Fed officials tells us about their transparency, but then cannot articulate a clear policy. Talking without clarity is not transparency. The discussion for the 80's and 90's was about Fed creditability but what is the level of creditability when you do not know what are the decision rules. Are we going to have to wait for an inverted curve? Nice review from ETF guide on the issue of inverted yield curves and recession prediction. Inverted yield curves have preceded all the major recessions in the US. If you had one market based tool to determine whether there will be a recession, this is the tool. You don't need any government data. You don't need any sophisticated statistics. All you need is some data on yields for different maturities. You can get the information from the FRED database. The important question is whether the market has changed so much that this time is different. By listening to the Fed, the only conclusion is that there is no recession that is possible because short rates are close to zero and long-bonds are significantly higher. There can be significant flattening of hundreds of basis points and we still would not get the inversion necessary for a signal. There is no need to worry. This is no need to anticipate a recession. My big worry is that we can have a recession with no inversion. Yes, this is a low probability event. We would have a recession without a tightening of credit. So what does this mean? 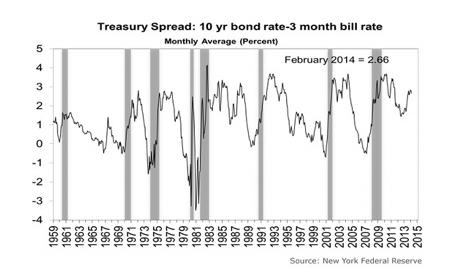 It would say that we can have tighter credit conditions and recession without a corresponding increase in short rates. This is worth thinking about. It would be a unique situation. You have to have a view about what is the natural rate of interest if you want to be an effective global macro investor. Where you place the natural rate is key to asset class exposure not only for bonds but also for valuation of stocks. If you believe that the natural rate of interest is close to zero or may be negative, there is no reason to rid yourself of your bond portfolio. You are also likely to accept the fact that the discount factor for other assets will be lower forcing valuations higher all else equal. You will also see that Fed policy should hold rates lower longer to get below the natural rate. The problem is that there is little agreement on the natural rate except that interest rates should be close to the long-tern growth rate in the economy. Low growth means low rates but the natural rate has to account for the stock of savings and the demand for investments. The issue of secular stagflation runs through all discussions of global macro investing. Call it the "new economy", the "new normal" or something else, but this is the benchmark theme that has to be used to assess current management strategy and portfolio structure. Most of the discussion concerning macroeconomics is about cyclical variation around the trend and not the trend itself. This focus is misplaced. Of course policy-makers and investor always are looking at what is going on in the short-run, but the big money and the overall wealth of the economy is driven by growth trend. Cycles grab headlines but trend growth drives long-term economic well being. Any policy-maker who is not engaged in discussion on the growth trend is really wasting his time. Not that the cyclical will always take care of itself, but inventory or credit distortions do have a way of solving themselves. The one-off level changes also cannot be solved. It can be thought of as a dead-weight loss. You cannot get back part of economy that is destroyed in a bubble. The long-run growth trend in the US is likely to be lower because there are strong headwinds that are not easily solved. There is a slowdown in the growth of productive inputs and there is a lowering of total factor productivity. The post-WWII period was an unusual period of high productivity that is unlikely to be repeated. These headwinds cannot be easily solved and certainly will not be solved by just lowering interest rates. The demographics are also working against higher growth. Workers are getting older and their consumption patterns are changing. The growth and productivity boost from higher education is also behind us. The educational requirements are higher now to be more productive but the percentage who can go for higher education is hitting limits. Clearly, the boom in education post-WWII was significant. There was a major step-up in education and knowledge but current gains are more marginal. Income inequality has devastated the middle class which affects productivity and consumption patterns. This hurts growth. The size of the public debt is a net drag on any marginal government investments. Government investment will usually have lower returns on capital especially if it is focused on redistribution and not infrastructure development. How you spend the money matters. If this trend is lower for the US and the developed world, return on capital will be lower. The big money is going to be made in those places where trend growth is higher. Long-term rates of interest will be lower which leads to lower bound problems in rates. This issue of low rates affects our ability to get out of any cyclical growth shortfalls or gaps. There is less room for policy-makers to maneuver. Finally, crises or shocks that lower the level of GDP will have a long-term effect. Some formerly productive assets will not be put back to work. Some loses will not be recouped. On top of this backdrop there is the fact that monetary policy, through excessively low rates, will increase the chance of bubbles which may mask these secular trends. How can you trade stagnation when a bubble is pushing asset prices higher? You have to embrace bubble risk. Clients demand return, so the short-run cannot be forgotten. This is a sobering story, but one that has to be digested. I have been asked the question of whether systematic global is different from other forms of global macro investing. The answer is yes. We can break global macro into four types and two dimensions: those that are price-based and those that are fundamental data based and those that are systematic and those discretionary. The price-based global macro managers will rely on market information to make decisions. This could be prices within or across markets and is based on the belief that prices reflect the aggregation of market opinions and discount quickly any change in the macroeconomic environment. Prices are an aggregation of all opinions both good and bad. If there is macro evidence affecting price, it is discounted quickly and efficiently although the discounting process by the market as a whole may not always be correct. There is the assumption that the manager is no better at discounting information than others but may have an advantage at finding prices signals within the noise of daily trading. The fundamental based managers will use macro information to help make decisions under the belief that information about the macro economy is not fully discounted in prices or the form of discounting in the market is not correct. The market may form rational beliefs, but those beliefs may not always be correct. Using insight, the manager believe he can better discount this information. The systematic manager will measure tine varying risk premium along with fundamental factors to help skew bets to those which have a higher chance of success. Discretionary trading will adapt or change with the news presented and will focus on the discounting or interpreting news stories surrounding macro events. Clearly, there will be a focus on what policy-makers are thinking to make forward-looking judgments. The systematic managers will focus more on factor analysis and risk premiums. Of course, many managers are hybrids of these strategies and incorporate sentiment and flows with their analysis. However, one of the key drivers is momentum in asset classes and global macro fundamentals. Momentum is a critical component of both price and fundamental managers and cannot be overlooked. Price relatives across asset classes and through time will always be a key tool for any macro manager. Behavioral biases has been the rage for any discussion about finance over the last few years, but there has been less work on how you actually solve these biases. Many researchers want to identify these biases, but then argue with a level of overconfidence that the biases just do not apply to themselves. Mistakes are made but not by someone who is as thoughtful about discussing these biases. Finding fault is easy Now tell me how to make better decisions and don't tell me to stop with the bad behavior. Make some positive statements. The implication for many of these biases are clear, but the solution is not something that many want to hear. The behavioral bias solution is a clear focus on disciplined and systematic investing. Stop with the discretion and trying to be smarter than your peers and focus on a set of clear rules that can actually diminish or eliminate these biases. Money is more fluid than water and less steady than air. This is one of the key issues with understanding current markets. Regulators may want to control money but its properties constantly change and money is constantly moving. The financial crisis was related to fact that excess savings from emerging markets found a home in US mortgages as a safe asset. Money, post crisis, has been flowing to emerging market bonds as it searches for higher yields. This flow is not even discussing official money movement from central banks. Forget trade flows. The pass-through effects of changes in exchange rates on exports and import prices is highly variable across countries and products. So much of current trade flows is in intermediary trade transfers. The impact of changes in flows and exchange rates is real and swift. If an emerging market explodes its current account deficit, flows will start to move out and a crisis is likely. Just ask the fragile five of the emerging markets. Even flows within the EU will have a big impact on the real economies. It is not clear governments want more transparency in capital flows, so investors have to form ad hoc methods of getting flow information between government releases. This is why custody bank information has become so important. 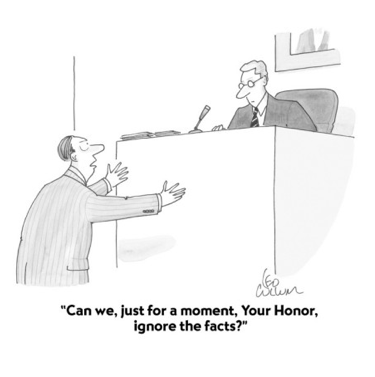 A quantitative focused manager has to have an opinion on the relative value of equities. This is not a question of whether you should buy based on a momentum or other technical factors but whether the market is rich or cheap from a macro perspective. What are the headwinds coming from valuations. The simplest valuation approach is to look at equity risk premia; however, the key current issue with this type of analysis is whether the current environment is so different that the equity risk premium is not giving us a good signal. What makes this time so different is not what may be going on with stocks but rather what is going on with bonds and the risk-free rate of return. Let's use a simple example. If the equity risk premium is the difference between the expected returns on equity and the risk free rate of return and the expected return on equity is the same through time, a decline in rates will lead to higher premiums. The market will look richer even without any change in stock return expectations. It would be even richer if there is a clear link between expected equity returns and change in rates. If a decline in rates is correlated with a decline in expected equity returns then the market would be richer. Unfortunately, there has been a breakdown between movement in rates and economic behavior because rates have been kept at the zero bound for five years. The current low rate environment means that the risk-free rate does not provide useful signalling of excess returns. This gets more complex when we are at a zero lower bound (ZLB) rate environment. In the case that rates should actually be lower the risk premium would be even higher. So we now have an another interesting issue with what could be the natural rate of interest. If rates are being kept intentionally low, high valuations may be false. The risk premium may be lower. If the natural rate is low or actually negative, the equity risk premium is actually higher. Rates matter in telling us whether risk premiums are high or low. Investors are supposed to form rational expectations. Think again. An extensive analysis of return expectations suggests that investors form their view through extrapolation of past performance. The work by Greenwood and Schleifer, Expectations of Returns and Expected Returns, is damning evidence against rational expectations, Do not follow what you see in surveys. It also tells us that systematic activity may be a better method for running money versus following the forecasts in herds which often just means following recent economic behavior. Since the work of Shiller on excess stock market volatility, there has been a growing concern that the assumption of rational expectations and market efficiency have to be revised or certainly looked at more closely. This work is an important addition because it reviews a number of sources for market expectations and gets the same answer. The author look at the Gallup poll, Graham and Havvey CFO survey, AAII survey, Investor's Intelligence survey, the Shiller survey, and Michigan survey. They are all correlated and all get it wrong. Good news is extrapolated into strong market expectations which are often not realized. As important, investor expectations are negatively correlated with model-based expected returns derived from dividend/price, consumption patterns and market valuation. Investors, no matter what the level of experience, do not seem to use the models that provide useful information on expected returns. Put differently, when expected return models forecast higher returns, they are usually correct. When the expectations of returns are high from surveys, the actual returns are low. These market expectations are correlated with mutual fund flows. The surveys show expectation that investors actually use, albeit incorrectly. Use forecast data at your own risk. Survey show bad forecasting skill You may want to fade market expectations.This just adds to the list of evidence that discretionary forecasting does a poor job. Models do better. Do not listen to the talking heads or the aggregated opinion of surveys. Use decision rules that do not rely on the opinions of others. Is return chasing the same as trend-following? 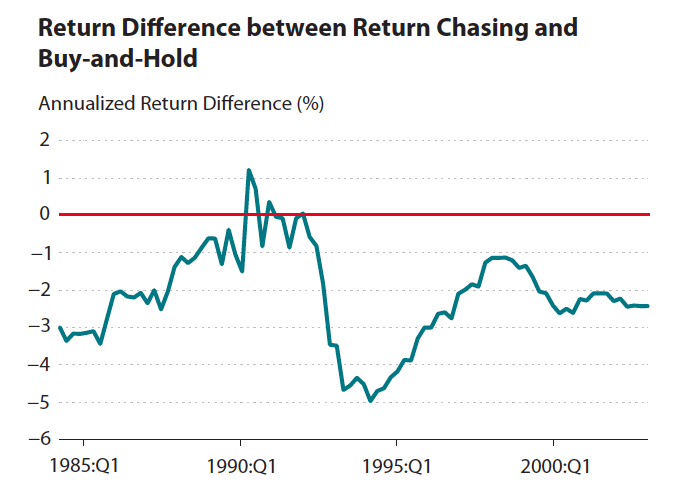 Recent St Louis Fed study, The Cost of Chasing Returns, suggests that investors are mainly return chasers and this behavior is bad for their financial health. The author looks at the correlation between past mutual fund performacne and mutual fund flows which is positive. Chasing these returns is bad for investor health and does worse than a buy and hold strategy over rolling 7-year periods. The return chasing is the time weighted returns based on the flows into the fund.The drag of following past performance as measured by the author looks to be significant. The buy and hold investor adds to positions in equal portions each period without any market view. Mutual fund investors buy at tops and increase on more strength. There is a current meme that trend-following as a strategy is bad because of the extrapolative behavior of investors. Unfortunately, there is a failure to think through the behavior of systematic trend-following versus looking at investor expectations through flows and their return result when plotted against market moves. Trend-following will buy rising markets, but will cut or reverse exposures upon reversal. This behavior is usually faster than the three quarter correlation showed by the author. Additionally, trend-following will use risk management to control exposure and cut loses. This does not occur with mutual fund return chasers. Yes, performance chasing with the crowds of mutual fund investors is bad, but that is not the same as saying following trends is a bad strategy. Extreme weather investing in commodities is more than just buying commodities when there are positive price shocks from bad weather. Now we are seeing extreme weather which has been good for growing in the corn and soybean belt and the price impact has been strongly negative. Weather shocks do not always have to be bad. 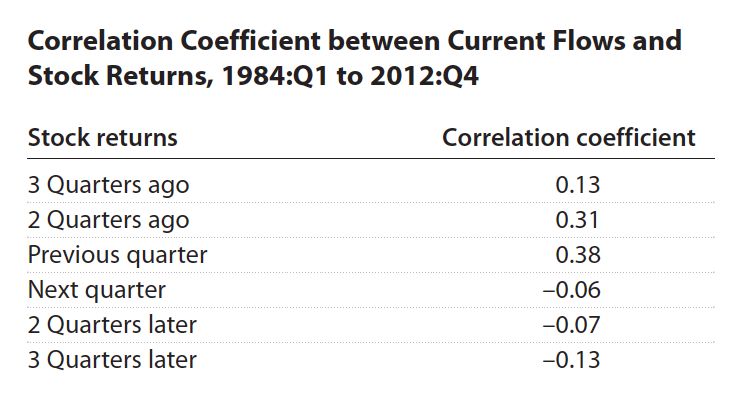 Good weather conditions clearly can cause negative price shocks. This is obvious, but has not been the focus of the long-only index crowd. Given inventory management, these negative price shocks usually are less likely to be exaggerated but they can still be large. The inventory management component, however, suggests that the impact may be more long-term. The inventory can be held off the market but must be worked-off. Good weather with strong planting and inventory carry-over from the prior year is the perfect storm for a price decline. Well, it looks like we are having that in the corn, wheat and soybean markets. Of course, we are right now talking about this in the past tense with a 30% corn decline in the last three months. We are not forecasting that another 30% is on the way. 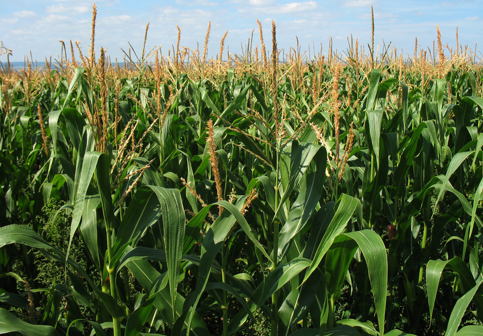 What we are suggesting is that good weather can be just as strong an impact as what we saw in the Midwest crops a few years when heat and drought drove prices higher. The only thing stopping further decline is any chnage in weather conditions relatiev to what has already been discounted in prices. The weather shocks have to be decomposed into local and global effects as well as short-term in periods of weeks and longer-term in periods of the production cycle. There is both a macro and micro component. Bigger move will spill-over to macro effects and more long-term.The macro component is the overall price rise across asscoiated markets and through time. The micro component is the fact that different weather can effect specific regions and be more localized or affect only nearby futures contracts. Well, the good weather of this crop year is enough to have a global impact and is likely to carryover to next year planting behavior. The macro issue is the impact on farmer income and this crop decline is going to hit incomes. "If you don't have a competitve advantage, don't compete." "If you dont' know where you are, a map won't help." Research is formalized curiosity. It is poking and proding with purpose. People are unlikely to know that they need a product which does not exist. This is a great quote for anyone who wants to have the status quo altered. On one level, this is the essence of conservatism. A change may not solve the current problem. It may make it worse or create new problems. Hence, there has to be a careful review of any change. Growth versus Value - a simple difference? The passage is a nice way to focus on an age old question for any equity investor. Growth versus value is always looking at different parts of the same equation. What is the form of discounting which is in the denominator and what is the forecast of cash flows which is the numerator? What is the assumption of earnings today versus earnings tomorrow and what are the risks associated with those future earnings? FX volatility continues to stay at low levels. If FX rates represents the relative price of money around the world, there is little differentiation. If the factors that drive the relative price for money don't change, there will be no volatility. FX volatility is also tied to the volatility of other asset classes. The fall in volatility has matched the decline in equity volatility. If there is limited volatility in other asset classes there will be limited volatility in capital flows that move across countries. The fall in volatility is related to the underlying volatility of the macroeconomic information. Since the foreign exchange is the relative price of money, volatility has to be related to the relative value of economic growth, inflation, etc... If there is no difference in the economic data, there will be no difference in exchange rate data. No relative surprises, no changes in FX volatility. However, the poor data coming out of the EU relative to other countries may be a sign that there is starting to be a divergence between economic fundamentals. While not immediate, it is sign that FX volatility may start to see some changes. 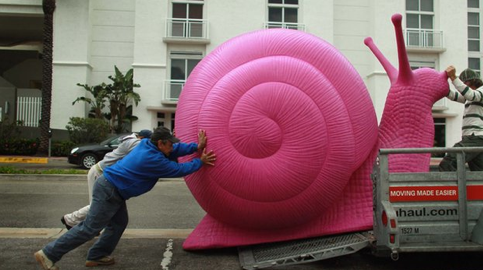 Risks are building - can you pull-out in time? Rajan, the head of the central bank of India and a former professor of the University of Chicago, is always one of the most insightful commentators on the economy. He is no friend of unlimited QE. We have quoted him before and have been impressed by his work. His comments are what everyone is thinking right now. Ride the monetary wave. Bad news will just mean that the Fed will continue to keep rates low longer. Do not fight the Fed. Some astute analysts will say that this cannot continue and the response will always be the same. I can stay at the a party because I am good at getting out at the right time. I will be faster than everyone else. Did that work for many in 2008? When the next set of really bad news comes many will just view it as a buying opportunity and miss the chance to get out of the market. "Too large a proportion of mathematical economics are a mere concoction, as imprecise as the initial assumptions they rest on, which allow the author to lose sight of the complexities and interdependencies of the real world in a maze of pretentious and unhelpful symbols.” - The last paragraph of The General Theory by Keynes. Look beyond the numbers and build a story around the what is happening. Intuition is always needed. It is needed before you look at the numbers to frame what you may see, and it is needed after you see the numbers to describe what you were looking at. HBR blog mentions outcome bias, the belief that random outcomes are the result of your choices. The odds can be in your favor but that does not mean that you will always win, and you cannot change your behavior the first time you lose. The real discipline in trading is letting the odd do their work. Patience is sticking with your decision rules while the evidence builds on its success or failure. The speech by Fed Vice Chairman Stan Fisher is important because it discusses the uncertainty that we face in the current macro-economy and the difficulty with running any monetary policy. First, it admits the current economy is weak in spite of six months of above 200,000 in new jobs. The forecasts have not done a good job and there have been downward revisions. Second, the speech focuses on the uncertainty associated with permanent and temporary labor issues. We are having a hard time untangling this mess of information.Third, it also admits the difficulty with disentangling supply and demand factors in labor and the current issues of cyclical and permanent changes in labor markets. Demographics and other issues may preclude many from ever going back to work. We do not know the true level of slack in the economy. Some may say that this means the Fed should error on the side caution and hold off any rise in rates. That just means it will be harder for the Fed to determine the right action at the right time. The volatility of stocks and other asset classes are currently low by historical averages. However, there are some very reasonable explanations for this low volatility and why it may extend. It is related to volatility in the macroeconomy. There are other factors that could drive volatility, but business cycle risk is a key determinant for low volatility. Yes, volatility will be mean-reverting but only because the volatility of macroeconomics is mean-reverting. However, if there is an extended period of low macro volatility we should see the volatility of stocks also stay low. The period of the Great Moderation in the macroeconomy was a time of low volatility. It was punctuated by crises, but the VIX index was generally range-bound. If central banks and governments around the world attempt to dampen volatility, there will be a corresponding dampening of stock volatility. It seems as though controlling the variation in macro-variables has been one of the policy objectives. Hence, we will not see an extended period of high VIX levels until the underlying components of macro economy get more volatile. We will have to see more two way changes or variability in consumption, investment and labor to get the asset volatility higher. The key to generating returns in the global economic environment is through understanding how risk premium vary across the business cycle. Get the risk premiums right and you will always be tilted in the right direction with portfolio construction. Risk premiums across all asset classes show a pattern that is consistent with the behavior of business cycles. Expected returns are highest during those periods when risk high during market downturns. 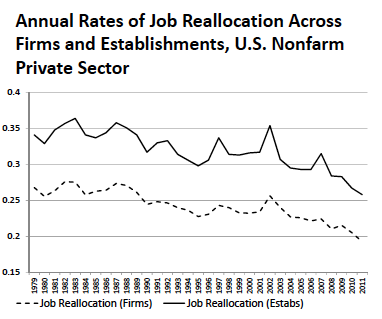 Similarly, returns decline at the height of the business cycle. you get paid to take-on risky assets when the economy looks bad and others are willing to walk away form risk. You don't get paid to take risk when things are good and everyone wants to buy risk assets. Following risk-taking around the business cycle is inherently counter to the view of many. Countercyclical investing is the key to global macro trading. Modern finance through stochastic discounting models focuses on the risk premium through the covariance between returns and the discount factor. if the covariance is negative, then risk premiums will increase when the discount factor decreases. The discount factor is related to changes in wealth and or consumption. The risk premium goes up for assets that negatively covaries with the marginal utility of consumption. Investors do not like assets that go down when consumption or wealth falls. Investors want a hedge against falling consumption and will pay up for those types of assets. Risk aversion is also time variant. It increases when consumption falls. Any portfolio should be consistent with the stylized facts of time varying risk premiums. Robert Stambaugh's AFA presidential address focuses on "Investment Noise and Trends" He argues that the fall of equity ownership by individuals has had an important impact on the returns of institutional money managers. Individual stock ownership has fallen from about 48 percent to levels hovering over 20 percent. The individuals have traditionally been the noise traders in equities. They are the ones that may follow trends, not follow fundamentals and be subject to behavioral biases. These are the people who were actively trading, but in the view of some would have been better not to trade. They did not make the markets efficient. The fall in ownership by individuals has been matched by increases in index and passive investing. The active institutional managers were the ones that corrected the mispricing from these noise traders. If there are less noise traders, there will be less mispricing. The result is that active managers will not have opporuntities to make money from these individuals, the noise traders. The profits from active traders or the alpha that can be generated will fall as the same or more money will be chasing after fewer or smaller opportunities. The result will mean that active managers will not be able to generate above average returns which is what we have seen. The passive benchmarks have done better because there are just less opportunities for those who are active. Active traders need noise traders. The result of falling noise trsders will be a decline in active management. Lower fees for active management. Less active bets. A move to passive management. The money management industry is in upheaval with the decline in noise trading and being smart may not be enough to survive. You have to be smart relative to your competitive peers. Active managers must accept sharper pricing and a premium on asset gathering. The small active manager will have to provide something special. 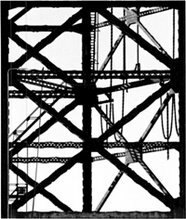 A recent August 2014 Journal of Finance focuses on fund manager skill. 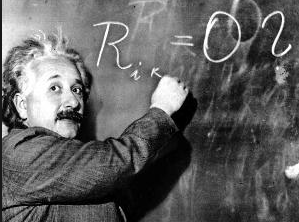 The research found that skill actually is the combination of two parts, stock picking and market timing. There has always been the idea that skill can be either through adding alpha or controlling beta, but the best managers do both. Skill manager seem to be able to pick stocks in up markets and cut market exposure in recessions. These are the managers who significantly outperform their peers. It is this two part process which makes managers special. Pick your good stocks but when the markets get rough stand aside and move to cash. The stock market is down and the VIX is up. The fear index is telling us something, but the issue is whether this is a signal that should be acted upon. The VIX index is volatile so any signal will have to be strong to offset the high volatility. The VIX history has gone through some long trends and the current increase has not broken the current long-term downtrend. Short-term spikes in the VIX are often quickly reversed and do not always represent a strong signal on asset allocation. The use of the VIX as an asset allocation tool has had mixed results. There is no question that delevering and selling risky assets when the VIX reached high levels was a good trade. The late 2008 VIX signal was extremely valuable, but we are now almost six years from the crisis and the VIX has become a trickier signal to use. First, if you are using any signal tool that looks back over time, you will be strongly biased by the 2008 spike. The mean and volatility both moved higher in the post-2008 period. A threshold model will not generate signals in this environment. Do you throw out the data and lose information or do you average in these extremes? It makes a big difference. Second, the form of the signal matters. There is a strong contemporaneous relationship between VIX spikes and stock declines but if you do not act immediately, you will have a very different pay-off function. It is the lag between VIX changes and returns that matters most if you want to have a useful signal. However, the VIX is mean-reverting and the level has a lot of room to climb especially if sentiment further changes to the negative. ISDA has voted that there has been a credit event with Argentine bonds which will trigger credit default swap provisions. This is the second time Argentina has default since 2000. Should this lead to a contagion in other markets? The simple answer is no, The events associated with this default have been ongoing and unique to Argentina, but the current sell-off in high yield suggests that credit investors are waking up to the risks from just grabbing for yield. Know your borrower. 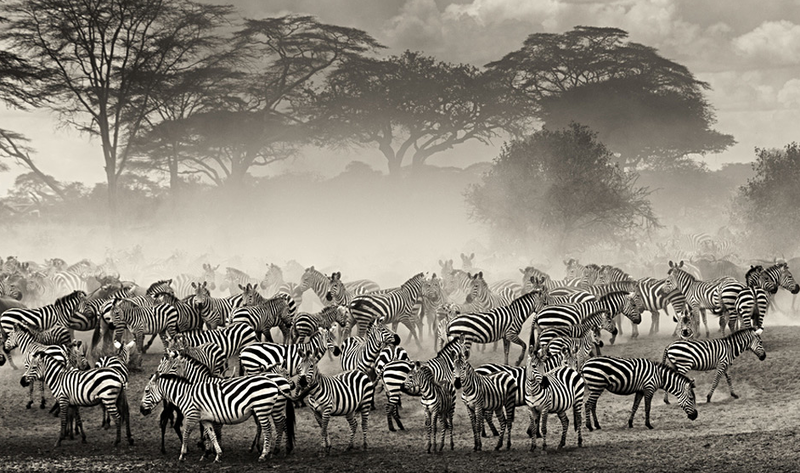 The contagion is like the zebra herd that may sense a lion coming closer. The pack starts moving perhaps on a twig snapping. Once the herd is moving is hard to say where it is headed. 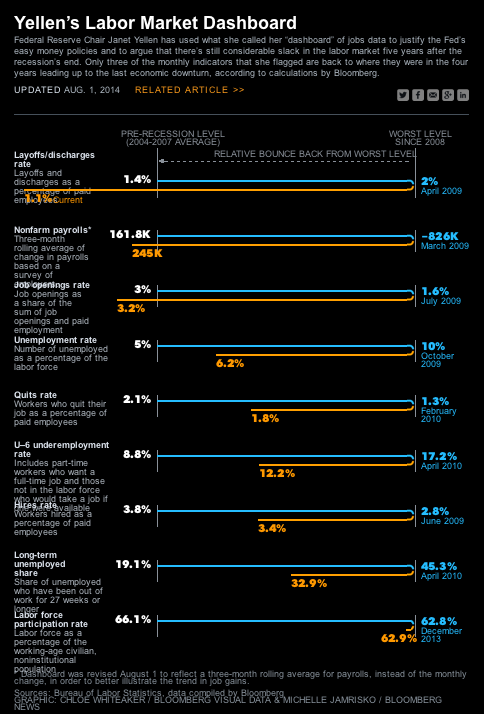 Bloomberg graphics provides the Yellen labor dashboard in one chart. The story is consistent with the problem between cyclical and structural unemployment. The cyclical numbers are looking better. For example, non-farm payroll is better, the job opening rate is higher, and the unemployment rate is falling. However, numbers like long-term unemployment share, labor force participation, and U-6 underemployment all show there is a long-term problem. The question is whether monetary policy can solve the structural problem and whether following current policies will harm the overall economy.